Acne, and its associated problems, is probably one of the most discussed and misunderstood health concerns. The reason may be because we typically try to identify ONE factor, culprit or villain responsible for our misery and frustration. We want to understand what causes all those blackheads, whiteheads, pimples and painful cysts, and so we place the blame on our diet, puberty, the environment, etc. If we can just pinpoint the exact problem, then we can cure ourselves of our acne, right? Acne is a complex disease and cannot be attributed to only one factor. What is driving the formation of pimples is more complicated than the physical symptoms that appear on the skin. The common denominator in all cases of acne is the over production of sebum by the sebaceous glands, which can lead to clogged pores. As dead skin cells accumulate around these pores, an ideal environment for the growth of bacteria is generated, often resulting in acne symptoms such as pimples, blackheads, etc. The cause of this over secretion of sebum, an oily substance created in the sebaceous glands, varies considerably from person to person. For instance, for women with overactive adrenal glands, the cause of their acne can be linked to the elevated levels of testosterone (an androgen) found in the bloodstream. Adolescents undergoing a growth spurt have very high hormonal levels, as do menstruating women, and for some, genetic variation is a large contributing factor-if parents had acne it is likely their children will also have acne. There is simply no single component to easily label as the true cause of all acne. 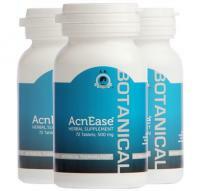 AcnEase® has mild antiseptic benefits, but its method of action is to mediate the impact of hormones on the sebaceous glands WITHOUT changing or affecting those hormones. This is a safety issue! This is also why it is safe to use by both women and men, from pre-teens to any age. A key secondary aspect, outlined below, is the growth of bacteria in clogged pores and the impact this bacterial growth can have on the progression of acne. Step 1: Acne begins to take form when there is an over-secretion of sebum (skin oil) by the sebaceous glands. Under normal circumstances, sebum travels along the hair follicle to the surface of the skin. Step 2: Pores in the skin become clogged with excess sebum and dead skin cells (seen as whiteheads and blackheads). With acne, the normal transport of sebum out of the follicle is impeded, leading to an accumulation of the oily substance. Step 3: Bacteria (P.acnes) grows in these clogged pores. Excess oil, paired with dead skin cells provide an enriched breeding ground for bacteria. Step 4: The body sends white blood cells (inflammatory cells) to kill the bacteria. Designed to fight off infection, the immune system targets the affected area of the skin. Step 5: The formation of pustules and papules with redness surrounding the pimples occurs. This is the physical symptom of the acne condition. Step 6: Inflammation spreads outside the pore to surrounding tissue to form cysts, the most severe form of acne. Formed under the skin, this painful variation of acne is often the most difficult to treat. When considering treatment options, it is important to understand what stage of the acne cascade they impact. For certain products like the systemic antibiotics (tetracycline, minocycline, and doxycycline) along with topical antibiotics, it is clear that they interfere with Step 3, which relates to the growth of bacteria trapped in the pores. Unfortunately the use of systemic antibiotics is also associated with a growing concern of antibiotic resistant bacteria. Although the primary bacteria associated with acne is P.acnes, the use of systemic antibiotics can lead to the growth of other bacteria that can become antibiotic resistant. There are additional broad spectrum antibiotics like erythromycin and clindamycin that are prescribed for acne, again contributing to the development of “super bugs” that mutate and no longer respond to standard antibiotic therapy. As you can see, while clogged pores play a large part in the formation of acne, the condition of acne is not entirely attributed to the amount of bacteria found on the skin. If it were that easy, the solution would always be to simply wash frequently. For anyone who has spent countless hours and dollars trying out the latest in skincare trends, there is no amount of washing alone that will cure anyone of all acne symptoms, especially in more stubborn and severe cases. Given the overall complexity of acne, it is often useful to consider combination therapy to obtain your desired results. Since AcnEase® is the only product that prevents new pimples from forming, it should be a member of any combination therapy regimen. Use of topical agents which can prevent bacterial growth or unclog pores are valuable in treating existing acne, but do little to prevent new pimples from forming. Conversely, adding topical acne agents to your AcnEase® regimen can help treat existing acne by unclogging pores or preventing bacterial growth in clogged pores, which can limit inflammation and subsequent skin damage. 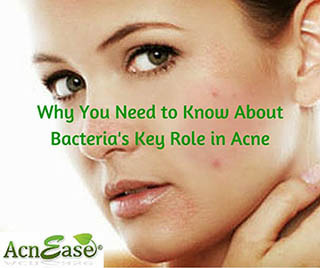 Some people look to antibiotics for the treatment of acne. If using an antibiotic becomes part of the treatment paradigm, topical agents should be the first priority, as they are less likely to spawn antibiotic resistant bacteria. It is important to recognize that antibiotics ONLY address the infection and inflammation caused by bacteria. They DO NOT remove the cause of acne that is most often due to a hormonal imbalance. So while antibiotics may temporarily help by killing bacteria, when you stop using them the acne will return, as the source of the problem was never addressed. In addition, antibiotics have been known to cause a number of side effects, from stomach and GI issues to antibiotic-resistant “super bugs” such as MERSA. Additionaly, a dermatology team at NYU Langone Medical Center in New York City recently published findings in the Journal of the American Academy of Dermatology that showed doctors kept patients on antibiotics for an average of 11 months before deciding they were not effective and switching to Accutane, a stronger acne treatment. Reasons for the long delay included strict controls placed on Accutane due to its risk of causing birth defects, and concerns about other potential side effects such as depression, according to the research. Accutane has been removed from the market due to a class action suit because of its severe side effects. Its generics are still on the market, and have similar side effects. In the UK, the National Health Service (NHS) has reported that acne patients are starting to show signs of acne related bacteria that are resistant to standard antibiotic therapy. In all instances, the use of antibiotics, whether topical or systemic, intervenes at a stage of existing acne (step 3) and does not prevent the formation of new acne pimples. The only treatment option that prevents acne pimples from forming is to reduce over-secretion of sebum by the sebaceous glands, the first step in the acne cascade. AcnEase® is unique in that it is the only non-prescription medicine that interferes with the first step in the acne cascade (over-production of sebum) and therefore really is the only OTC agent that prevents acne from forming. While clean, healthy skin is a big step in the right direction, in order to enjoy lasting results, the source of the problem must be addressed from within. We want to hear from you! Do you have a favorite treatment regimen that you always rely on to address your acne? Let us know in the comments below!